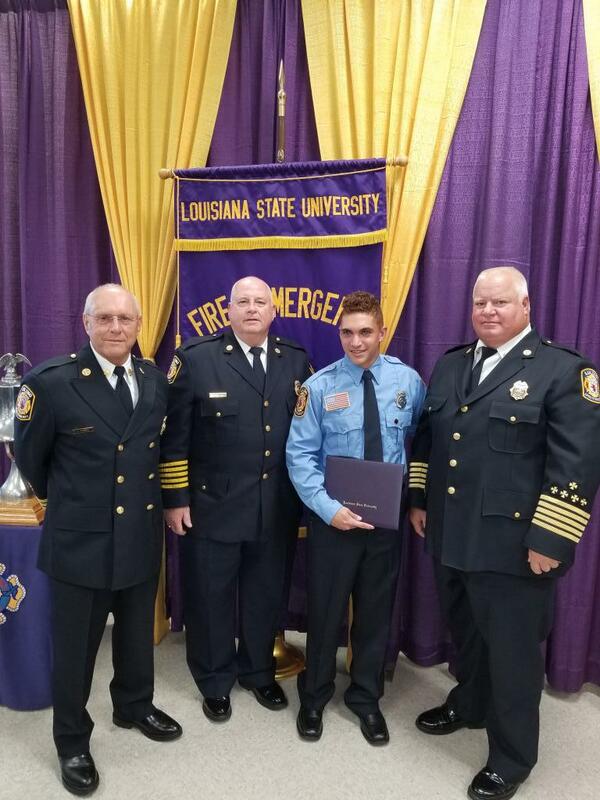 On August 10, 2018 Richard Borden graduated from the LSU Fire Emergency Training Institute certified as a Professional Fire Fighter. Richard attended LSU-FETI Recruit Fire Academy course that is designed for entry-level firefighters and is taught under the same paramilitary chain of command used in today’s fire departments. The recruits stay at the facility for 13 weeks and graduate with the following Certifications; Haz Materials Awareness, Haz Materials Operations, Fire Fighter I & 2, and Emergency Medical Responder. Richard is one of three full time fire fighters employed by the department. The full time employees support the volunteer staff in providing fire protection, EMS, Fire Prevention, Apparatus, Equipment & Station Maintenance and training. Chiefs Tassin, Minnich and Petit with Fire Fighter Richard Borden.